A group of armed naxalites has reportedly been sighted. 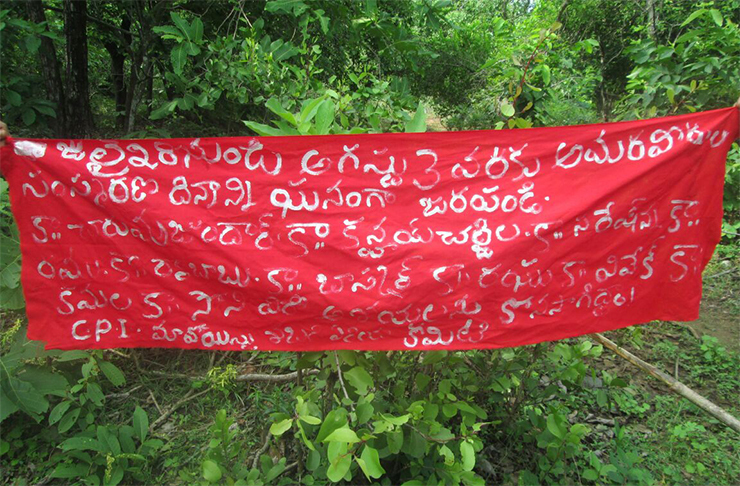 For reasons best known to them, the Maoists seem to be unable to shun Adilabad or other North Telangana districts as their support base despite suffering tremendous losses in the past in the form of encounter deaths of their top leaders and surrender of numerous cadres. A 20 to 25 member strong dalam of armed naxalites has reportedly been sighted in the villages in Vaipet forest area of Indervelli mandal of Adilabad and another handful of them at Parkal and Bhupalpalli of Warangal and a few places in Nizamabad in the last few weeks. 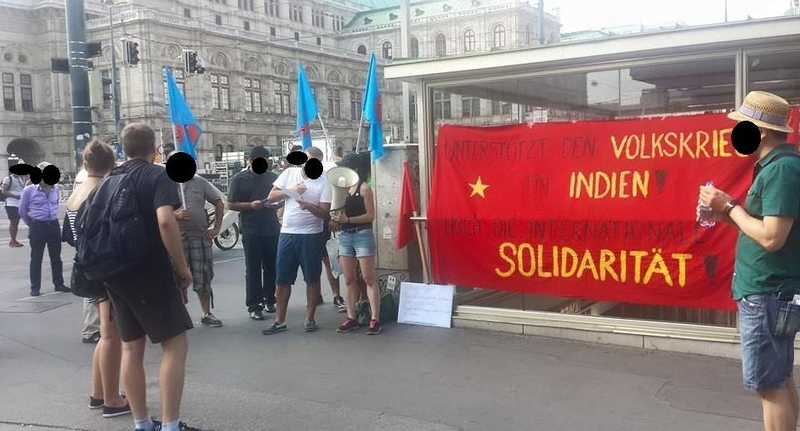 Revolutionary Construction (Revolutionärer Aufbau/RA) is part of the International Committee to Support People’s War in India (ICSPWIndia), and so it took part at the international campaign and called other revolutionary forces in Austria to support the campaign and the people’s war in India. 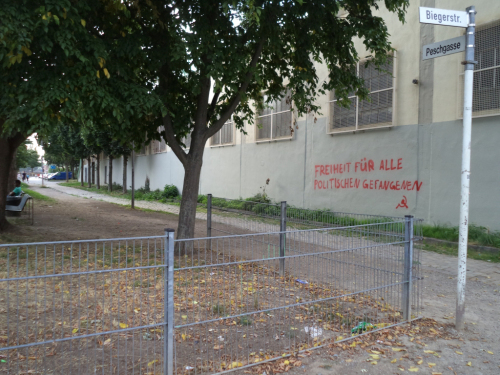 Because of our initiative actions for the campaign took place in different federal provinces in Austria. 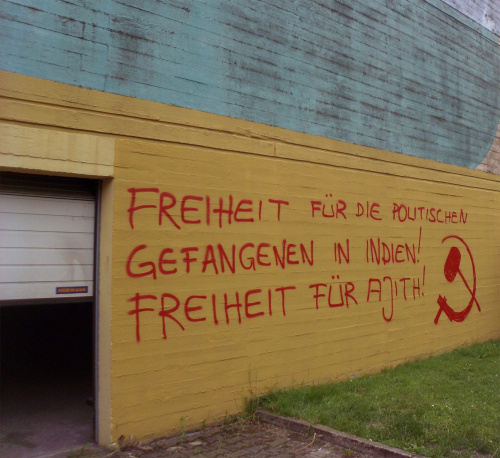 We made meetings to inform comrades and sympathizers about people’s war, the CPI (Maoist), the hindu-fascistic terror in India; to present the work of the ICSPWIndia; to propagate the importance of international solidarity and to go on with the unity of the maoist forces in Austria. 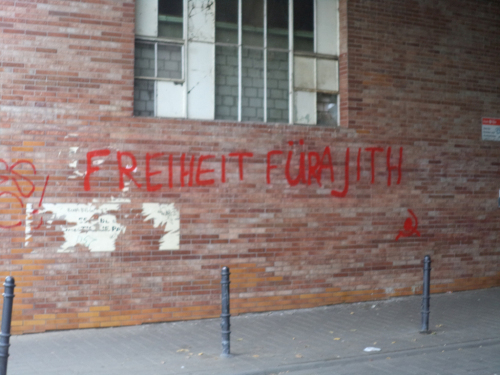 There was participation for this campaign in five federal provinces, which meant big success for the revolutionary movement in Austria. It also meant success for international solidarity, because new forces were united under the banner of the ICSPWIndia and got active for supporting. 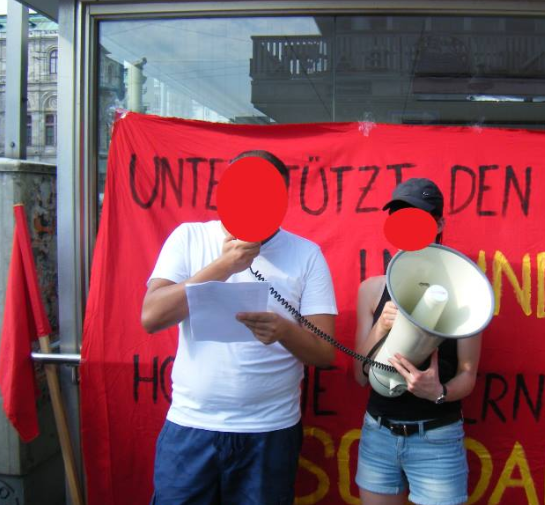 In Vienna a committee for solidarity was formed with Turkish comrades from ATIGF (Federation of Workers and Students from Turkey in Austria), ADHF (Federation for Democratic Rights in Austria) and comrades from RA (Revolutionary Construction). Critical we have to say, that this committee was formed very late, so that some actions took place short-dated. However the unity of these forces for supporting people’s war in India, is a positive and correct step forward. 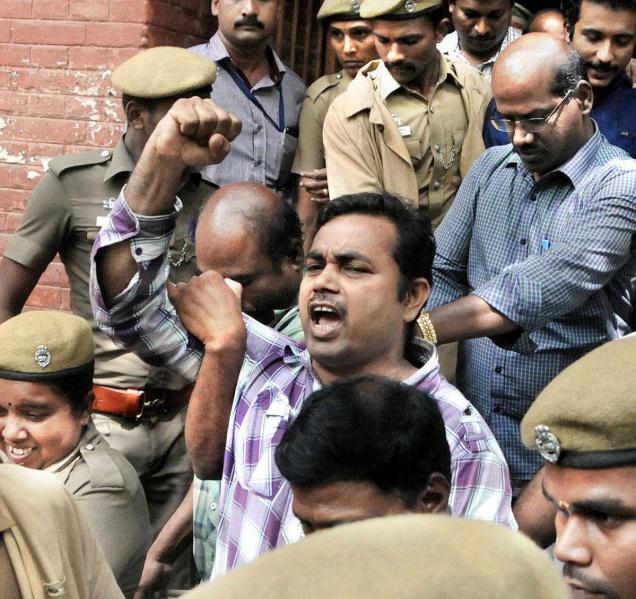 Free all political prisoners in India! KOLLAM: Maoist leader Roopesh, who was under police custody for the last five days, said he would continue his hunger strike in the Coimbatore jail as he was not being treated as a political prisoner and were denied the rights of one. The district court on Wednesday sent him back to Coimbatore jail as the police did not seek for an extension of his custody. Roopesh was on hunger strike since he was brought to Kollam on Saturday demanding the authorities to consider Maoists as political prisoners and not terrorists. When asked if he wanted to inform the judge anything, Roopesh said he was not given an opportunity to file a petition before the Coimbatore District Collector seeking removal of UAPA imposed on him. While being taken out of the court, he shouted slogans seeking withdrawal of draconian laws such as NSA and UAPA.During his stay here, he abstained from having solid food. The court had granted a five-day police custody from Coimbatore jail on Saturday to investigate his links to two other suspected Maoists arrested earlier. Kundara police had in May arrested Remanan, 44, from Sasthamkotta and Anandan, 50, from Kundara for allegedly procuring SIM cards with forged documents. These SIM cards were found to be purchased from a mobile shop in Bharanikkavu. Roopesh allegedly contacted a weapon dealer in Coimbatore using one of those SIM cards procured by Remanan and the call details were finally traced, which led to the arrest of the duo. NAGPUR: The internal security at Nagpur Central jail has been stepped up with some sensitive inmates being put under special surveillance as the day of execution for 1993 Bombay bomb blasts convict Yakub Memon draws near. The jail officials, fearing a mass revolt or some other forms of protest, have also increased security within the jail manifold by summoning manpower from other units to Nagpur. The city police’s quick response team (QRT), which has commandos with sophisticated weapons, has already been deputed inside the jail and in the barracks where the sensitive inmates are lodged. The numbers of jail guards, deployed per barracks, have been increased. It is learnt that closed circuit television (CCTV) too has been installed at strategic locations on a war-footing. This is being monitored by senior officials. Additional lights have been installed along the jail periphery too. Sources said that several inmates, especially the ones held for taking part in the Naxal revolution, are being kept away from each other to ensure that they cannot communicate and put up a united protest. The Naxal inmates had threatened to start a hunger-strike and other form of protests against the execution order of Yakub. Some other inmates too were planning to join the protest. Though the jail officials have kept mum on the issue, a press note issued by sympathizers of the Naxal inmates confirmed that a protest movement is building up inside the jail. Security has been stepped up outside too with access being allowed to only identity card holders. City police were cautious while giving clearance to citizens and lawyers wanting to meet inmates. Meanwhile, an Indian Air force chopper has been hovering above Nagpur Central Jail and sensitive areas in the vicinity. Although defence authorities and the city police have been denying their involvement in the security surveillance, the choppers have been spotted since two days now. GADCHIROLI: A former deputy sarpanch of Godalwahi village in Dhanora taluka of Maharashtra was allegedly murdered by the Maoists as they suspected him to be a police informer. A Maoist unit reached Deorao Kirange’s (26) residence, woke him up, took him outside the village and shot him dead near a bridge on the Godalwahi-Kondawahi road last night, a police release said here today. 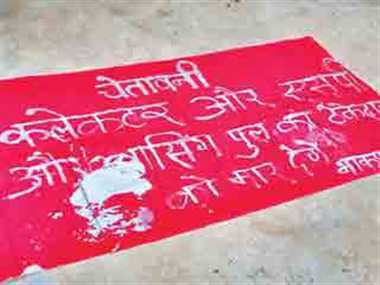 Deorao’s body was found on the road this morning with a letter near his body in which the Maoists mentioned that Deorao was killed because he was a police informer, the release said. The release issued by police identified Deorao Kirange (26) as the one who was allegedly murdered by the Maoists as they suspected him to be a police informer, though the police mentioned nothing about the victim. The Maoists are observing ‘Martyrs’ Week’ from July 28 in memory of their comrades who were killed in various police encounters. The police have deployed large number of personnel in Maoist-affected areas in view of this development and kept a tight vigil. An offence has been registered at the Godalwahi police assistance centre against the Maoists and anti-Maoist operations have been intensified in the area after the incident, the release said. 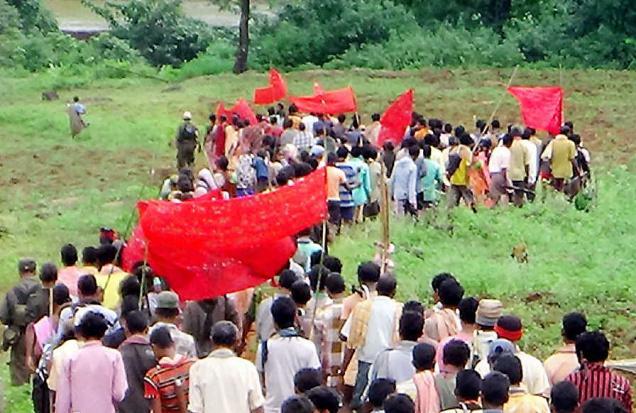 According to the police release, the Maoists murdered Deorao to spread terror in the area and oppose developmental works, A few days ago they had also killed a sarpanch of Damrancha village, the release said. 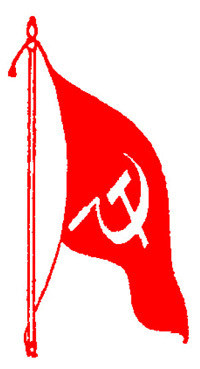 The Maoist party has been successful in setting a model of resistance against the onslaught of globalisation in the country, poet and writer Varavara Rao has said. Addressing Martyr’s Remembrance Week observation here on Tuesday, he said Maoists were dreaming of a self-reliant society without oppression, suppression or private property. “The state has become the agency of implanting globalisation policies. 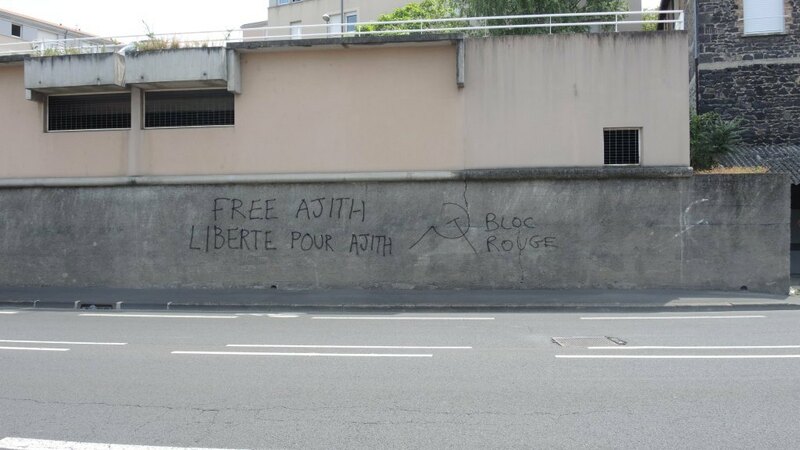 Maoists are the only party, who fight against globalisation policies. The forest areas in the country are under the threat of corporates as those are the mines of natural resources and cheap labour. 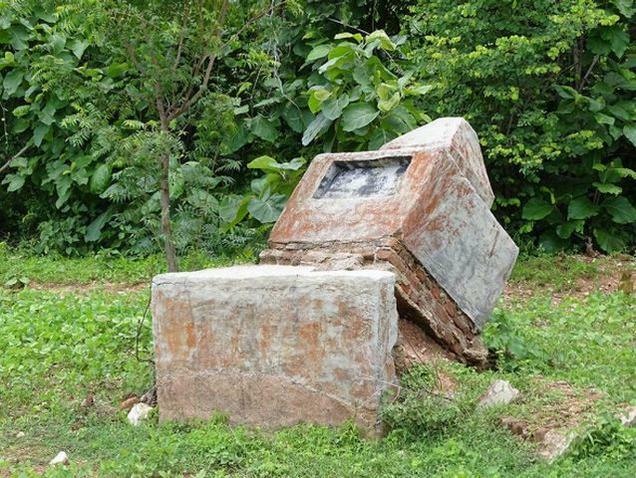 That’s why Maoists’ activities are focused on forests,” he said. “Even when the Constitution gives adivasis the right over forest resources, most parts of the country’s forests are under the control of the paramilitary forces,” he noted. In the name of operations such as Green Hunt, Thunderbolt and Vijaya, the state has been unleashing violence against the poor tribals. It’s a paradox that in a democratic country, the Army rules the entire North East and Kashmir, he said. As long as classes exist, class struggles too will be there, he added. The parallel government set up by the party in the Dandakaranya region of Chhattisgarh was a model of how people could win over oppression and harassment, Mr. Rao said. Praising the alleged Maoist activities in the Western Ghats area, the writer said there had been attempts by the party to spread base in Jharkhand, Chhattisgarh and the Western Ghats. “The Western Ghats area has the tradition of armed struggles right from the time of Naxalite activist Varghese. The government has tried to scuttle the activities through Operation Thunderbolt. Recently, they arrested leaders like Murali, Roopesh and Shyna. Though the arrests were a setback to the movement, they will reequip and hit back,” he said. Leader of Porattam M.N. Ravunny presided over the function.